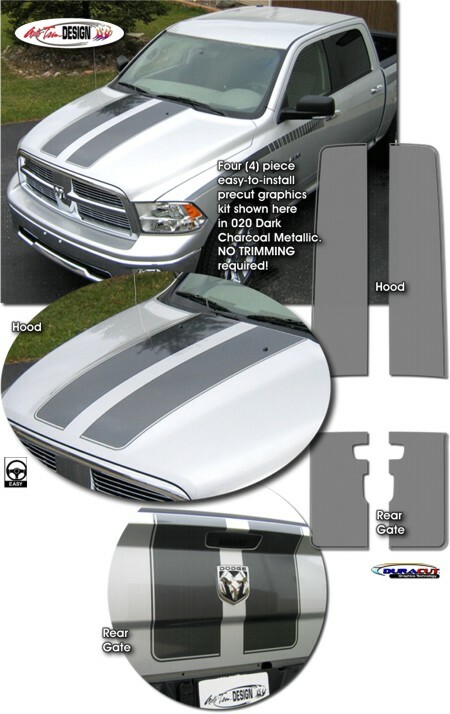 Make your '09-Current Dodge Ram Truck "Tough-looking" with this awesome Rally Stripe hood and rear gate graphics kit. This easy-to-install kit is packaged as a set of four (4) pieces with a classic 1/4" (6.35mm) pinstripe at the outside perimeter as shown. They're PRECUT and ready to install here in the Garage Sale in Light Charcoal Metallic - NO TRIMMING required! This particular kit includes Roof pieces for a Regular Cab Pickup. For other size pickups simply leave the Roof pieces off and the kit will look great just on the Hood and Rear Gate. Kit is specifically made for the '09-Current Dodge Ram Truck factory hood and rear gate areas and will not fit any other vehicle.